A new website was created to showcase Direct Granite & Marble’s excellent portfolio and fantastic color selection. ALX created a professional, attractive site with a built-in WordPress CMS. After receiving WordPress training, Direct Granite & Marble was able to update the site themselves, adding new portfolio images and specials as needed. Frequent updates keeps Direct Granite & Marble relevant across all major search engines. Every new business needs to start strong with a successful visual brand. 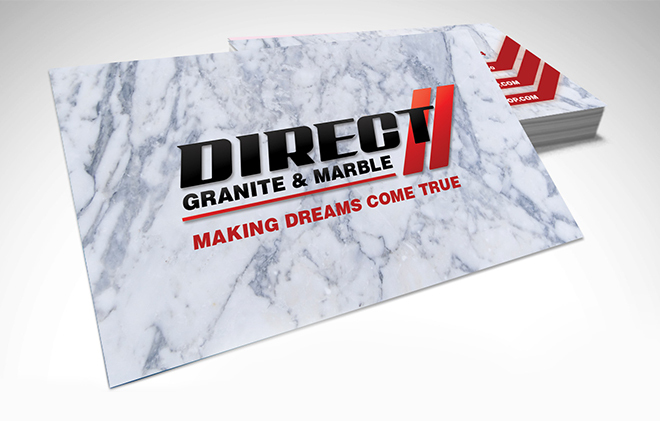 Direct Granite & Marble needed a memorable, attractive logo that would immediately represent them as a reliable, serious business from the day they opened their doors. ALX created a strong logo, with a powerful slab font and a statement red to immediately attract the attention of potential customers. ALX created a custom business card for each principal member of Direct Granite & Marble. The business cards were designed true to the strong brand colors of red and black, with a marble texture for added visual interest and visual association. The business cards were printed on a thick stock with a glossy finish for optimal presentation value and longevity. 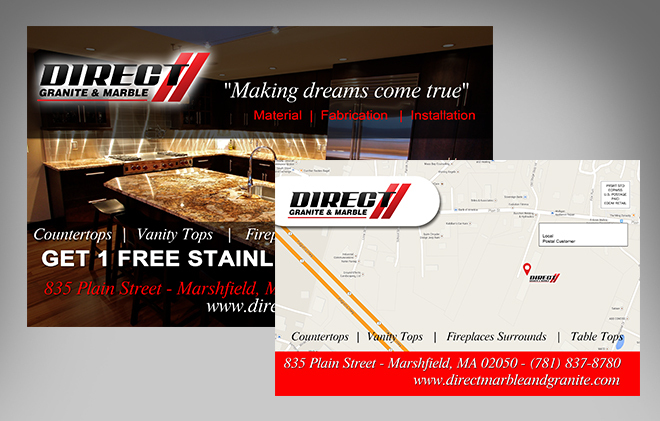 Direct Marble & Granite sent out custom designed EDDM Postcards to targeted neighborhoods within their service area. These attractive, high-quality postcards were printed in full color on heavy-weight glossy stock for optimal presentation. Receiving a postcard of such high quality warrants a second look, especially for homeowners considering redoing a kitchen or bathroom. The EDDM Postcards included a large map to advertise Direct Marble & Granite’s location, and a high quality photograph of their work, which printed beautifully. 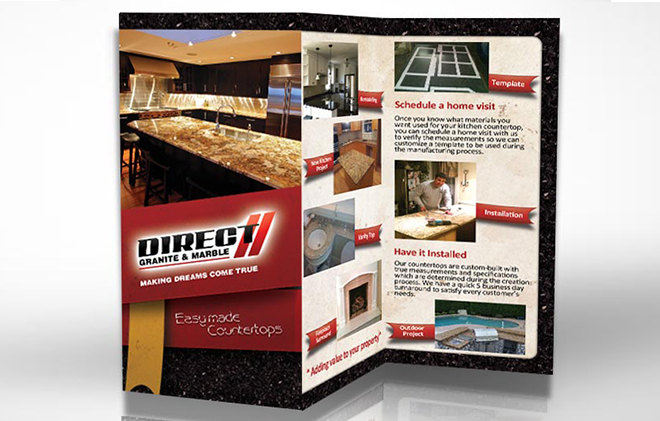 Direct Marble & Granite needed a tri-fold brochure to outline their process and services to new customers. ALX designed and printed an attractive tri-fold brochure with custom graphics that present the information in a visually engaging way. A custom designed brochure speaks volumes about Direct Marble & Granite as a professional, detail-oriented company that cares about quality in everything they do. The tri-fold brochure is perfect for displaying in their showroom, as well as distributing to kitchen and bathroom contractors who need a granite & marble supplier. 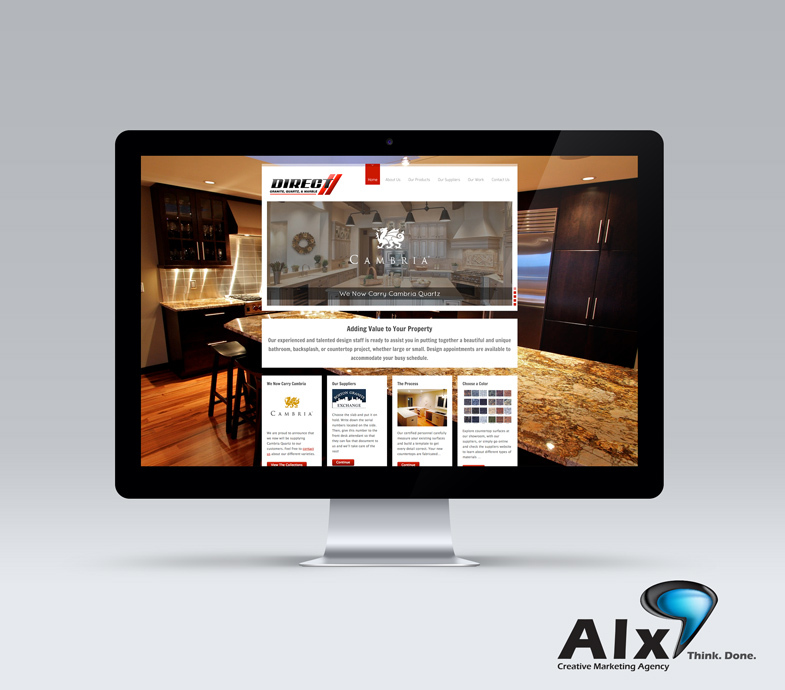 As part of their website package, Direct Granite & Marble received SEO services from ALX. Direct Granite & Marble is now registered and verified in major location-based search engines, and enjoys prime visibility among their competitors. Direct Granite & Marble also received training on how to remain relevant to search engines, including tasks like asking customers to write reviews and maintaining a social media presence. 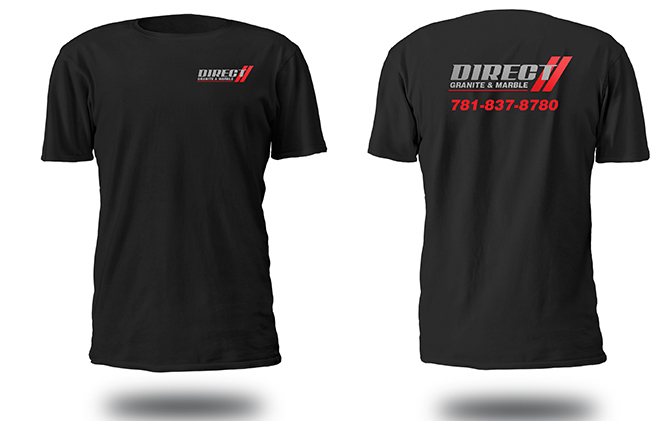 Direct Granite & Marble invested in custom Tshirts and Jackets, branded with their company logo and phone number. ALX branded these items with heat-transfer vinyl, which won’t fade or crumble with frequent wearing and washing. The t-shirts and jackets come in flattering men’s and women’s styles, for the best comfort and functionality. Because of the good fit and high quality material, Direct Granite & Marble’s employees can wear these clothing items anywhere outside of work. 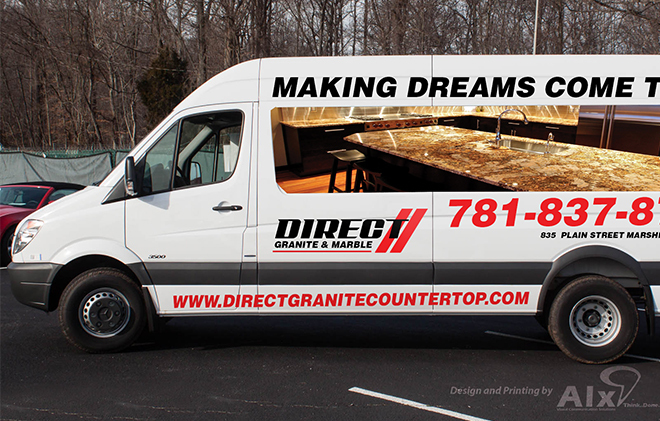 Direct Granite & Marble’s plain white work van looks incredible with a large, legible logo and phone number. Direct Granite & Marble wanted to make the most out of their frequent trips to job sites and estimate calls. Now their van advertises their work ethic and service areas while on the go.